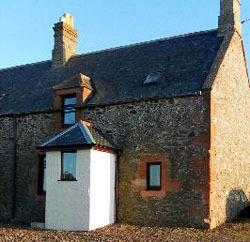 Townhead Farm Cottage is a converted farm workers cottage in the middle of a working farm. Situated on the edge of the Southern Upland way this cottage provides a memorable holiday destination for everyone. Found about 40 miles from Edinburgh, in the Scottish Borders, this self catering cottage, renovated to 4 star standard, offers a peaceful and tranquil escape. The stunning sea views and myriad activities within the local area, make visiting us a must. Whether you are looking for an action packed holiday with horse riding, surfing, golf or walking; a peaceful retreat with leisurely strolls along some of the most beautiful beaches Scotland has to offer; a historical tour of the many castles or an exploration of the nature reserves and bird nesting sanctuaries then this is the place for you. The cottage is available all year round and with each season there is something new to see. Barbeques in summer and cosying up beside the wood burning stove in winter, we offer something all year round.